The fourth puzzler was to count the number of missile results for this army, composed of Coral Elf and Firewalker units, with a guest appearance of an Undead unit in opposition. None of the effects include anything to do with melee, manoeuvre or save results, so these can be discounted. We have 9 missile and 6 IDs. The Wither subtracts 3 missile results. It does not matter which, but I have taken away the results from Coral Elves. The Landslide icon on the minor terrain halves the missile results (the IDs are missile results), so we leave as many IDs as possible. The Poisonous Cloud from the Water Dragon Breath also halves the missile results, but the rules state that a result can only be doubled of halved once, so this is ignored. Our 4 Create Fireminion SAIs become 4 missiles. 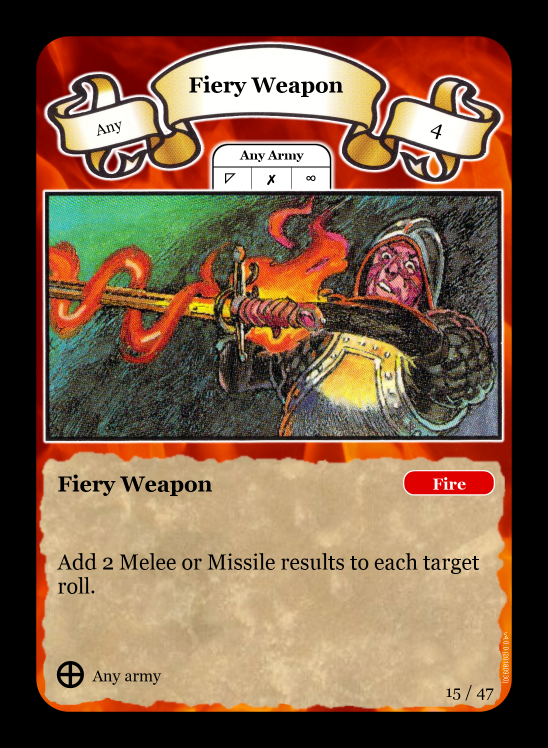 The 4 missile from the Fiery Weapon spell adds in another 4 missile results. This means that the total number of missile results, and the answer to our Puzzler #4 is 14. Congratulations to everyone who got this answer and thanks to Chuck for his continued assistance with producing answers and other advice.